And of course, keeps them in a nice log, just like the one below. Automate keeps everything up-to-date with safe upgrade. Stress-free automatic backups and upgrades. And now, you can also set Automate to perform all of this on a schedule of your choosing! By design, Automate checks for site for updates every 6 hours (about to be 3, we’re just doing some scaling), to make sure that all security issues are patched as soon as they are released and so that you don’t have to waste your valuable time backing up your site and applying updates. But we understand that a lot of our members are cautious about having their site constantly probed and keen for backups or any server intensive activities (like updates) to happen at a safe time. And, should anything go wrong, members don’t want their site to go down at 4 a.m. while they’re sleeping and not know about it. 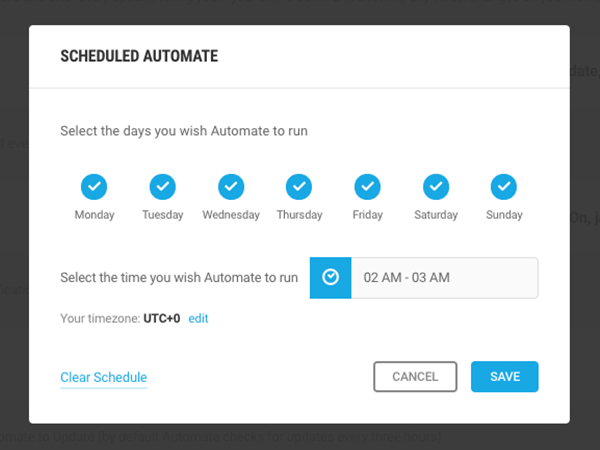 So now you can simply select the days and times that you want Automate to run! Let automate run on his own schedule with default settings. Now Automate lets you choose what days and times you want updates to run. Turn instant email alerts on and only get notified when something seems off. Essentially, a lot of our members don’t want to receive an email for every single Automate run, especially if you’ve got, say, 100+ sites managed by WPMU DEV, which a lot of you have. But you *definitely* want an email update when there’s something wrong, as detected by our Safe Upgrade feature that I mentioned at the start, so now you can select the % in variation between before and after screenshots (and naturally, if we detect your site has gone down, that’s a red flag straight away!) and if the updates create anything at or above that variation, we’ll immediately send you an email. Automate with peace of mind and enjoy the efficiency, time saved and security patching that you want. Strewth, not bad ‘eh Cobber… now we’re cooking with gas! We've got some incredible new features in the works and would love your feedback. Pop over to the roadmap and let us know what you're most excited about in the comments! Hi, great post. Question: What diference Plugin SEO WPMU vs Plugin Yoast SEO? Not very much at all… in fact ours is better, we think :) We’ll do a post on it soon! But it’d been nice to be able to create a schedule once, save it and then select it for every other website. When managing dozens of sites it’s taking quite some time to configure a schedule for every single one of them. Yeah, that would save even more time! I agree. Scalability is key, even if it is only saving the last 2% of time you would have spent manually updating. Sure thing, and noted… the next generation of the Hub (later this year) is going to contain a *lot* of tools for efficiently managing 100s of sites, this is a great addition. Is there any way to generate a monthly report to email to a client to show which and how many plugins have been updated? Yes :) Check your ‘Reports – beta’ tab in The Hub (also that’s currently getting a makeover and we’ll announce when it’s ready to go live)! At the moment there’s not really any integration with Automate, is there? A report just shows the version of WordPress and what plugin updates are available, but there’s no information about what updates have been executed during the reported time span. The Shipper! All-time favorite will be The Shipper! Where is it? It is very much under way… and I’m excited too! The plan is to make it the most simple, and successful migration experience you have *ever* encountered… which will take a little time. I asked for the scheduling feature recently. Very glad to see it. It changes how I do some things here and will allow me to put more sites into the Hub. Thanks!! It’s a pleasure, thanks for the excellent request! How do you set up to backup your entire multisite installation? The backups that are saved now only back up database. Not files. Or do I misunderstand the backup function? If you’re able to turn that option on in Automate then you already have Managed Backups activated for that site. If you don’t have it activated then it will give you a little popup modal that will instruct you where to go to activate it first. thank you for such quick answer. I do have Auto backup on. I got confused because as I tried to download one of the back-ups files from the Hub it only gave me the database file. No problem :) hmm, I just looked at mine for both a single site and multisite to double check and all the files are in the “www” subfolder inside the zipped up backup folder. If that isn’t there for you then yeah reach out to tech support and they’ll get it sorted out for ya. Congrats WPMUDEV for adding these requested features for your members !!! Yet more very useful and intuitive additions to an already powerful, useful and comprehensive “Hub” service !!! Great feature, more power. Thank you for this implementation! I have a few suggestion to The Hub, where can I point them? Thanks! There isn’t a “The Hub” option at the moment, but use “other” and just type in “The Hub”. I don’t see Automate in my dashboard. Is this a product not included with the developer’s license?